The next time you encounter a stuck trumpet mouthpiece, trombone hand slide trouble, or a fuzzy-sounding clarinet, skip the long drive to the repair shop and the associated service fees--and consult Band Instrument "Quick Fix" Repair Solutions instead. 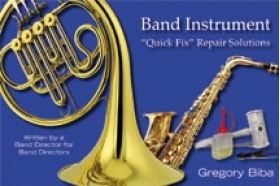 In an easy-to-follow and intuitively organized format, this manual provides essential repair techniques and instrument maintenance suggestions. Many repairs are so easy that you and even your students can perform them with basic knowledge and instruction. The condensed and simplified instructions in the manual guide you through each repair step by step. The instructions are supplemented by 60+ photos and illustrations and organized in a convenient spiral-bound flip-book format. Each instrument discussed in the guide is thoroughly labeled in the appendix. Written by a K - 12 band director with many years of emergency instrument repair experience, this is a must-have reference for all band directors.